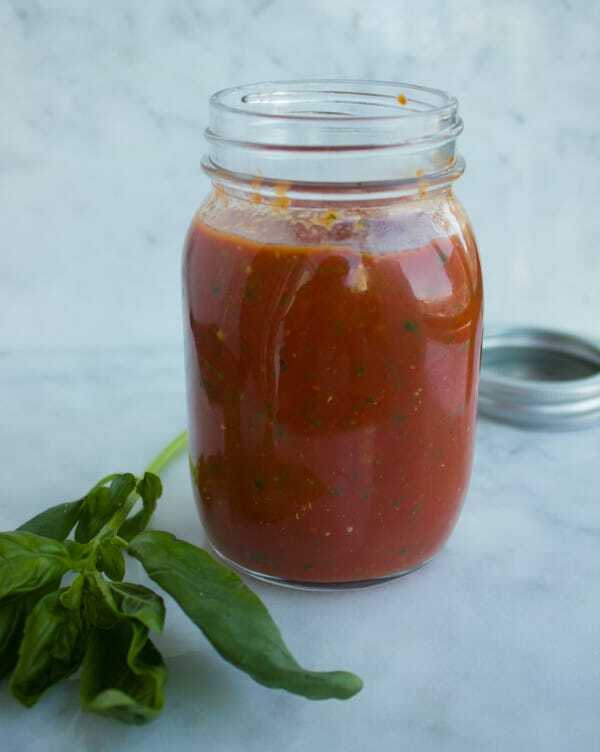 A perfect and quick homemade marinara sauce recipe that will be a staple at your kitchen. 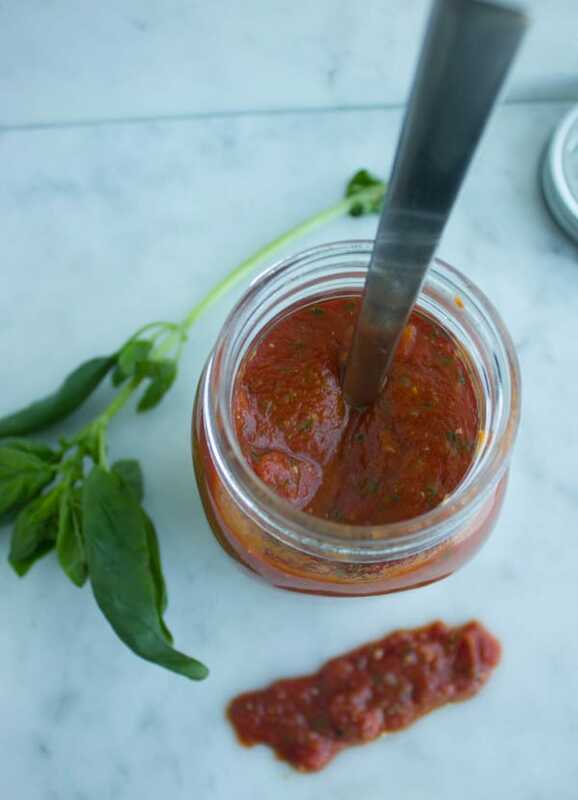 This sauce packs a ton of flavor from garlic, basil, oregano and a delicate fresh tomato base. It stores perfectly in the fridge and freezer, just heat it up and use it on many many recipes. It also makes a great homemade gift. I can’t count how many marinara sauces I’ve had over the years..most of them are homemade, but they each tasted differently..Some really emphasize the taste of sweet sautéed onions, while others don’t taste like onions and the emphasis is pure garlic. Some taste like none of those and dare I say are just bland and have a few herbs here and there. Some taste like over cooked tomatoes and almost feel like a stew…etc..etc..
Ok here’s where I’m going with all this, I love a marinara sauce that tastes faintly of onions so I use scallions, but packed with garlicky scents, and loaded, I mean loaded with herbs so fresh basil and dried oregano are my herbs of choice. 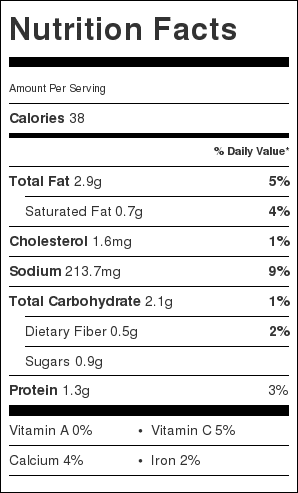 And one last thing, I love to taste the tomato flavor—which is what this sauce is about right? So I don’t cook my sauce for longer than 15 minutes (sometimes 10 minutes when I’m rushed). And this really serves another benefit—it’s really a quick sauce! Now to best infuse and make use of these flavors, it’s best to let it sit and cool down for an hour or better yet enjoy it when it sits for a day or two in the fridge. So I always make double and triple this recipe, use what I need that day and store the rest in my fridge or freezer for as long as I can—but it never stays for too long! It always finds its’ way back to my dinner table. Another quick tip : I love love the flavor of parmesan in this sauce, but unless I’m using the whole batch at once, I only add the Parmesan cheese last minute. The reason is the cheese when added to the sauce will change its texture once the sauce is chilled or frozen—it tends to separate just a tiny little bit. Preheat a deep skillet over medium high heat and add in the olive oil. When the skillet is hot, add the scallions and garlic and start sautéing them for a a few seconds. Season them with a pinch of salt and half the oregano spice and sauté for a few more seconds until the spice is fragrant. Add half the fresh basil to the garlic mixture and gently sauté for just a couple of seconds before adding the crushed tomatoes. Season the sauce with salt and pepper and the remaining oregano. Bring that sauce to a boil and then cover the skillet and allow the sauce to simmer on low heat for 10 minutes and up to 15 minutes at most. Uncover the sauce, turn off the heat and add in the remaining fresh basil. 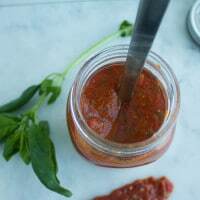 **if using the sauce right away, add in the parmesan cheese, but if the sauce will be stored in the fridge or freezer then at the time of use, add in the cheese. 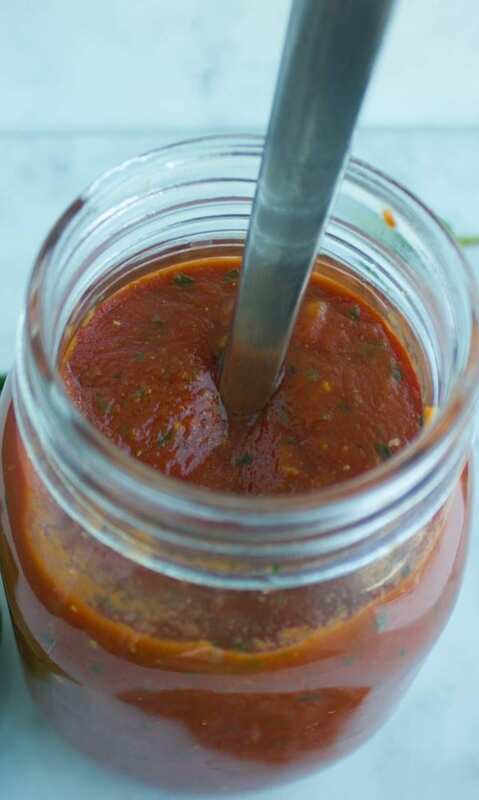 This sauce keeps for at least 2 weeks in the fridge and up to 3 months in the freezer. Reheat before using and you may want to add some more fresh basil for freshness!